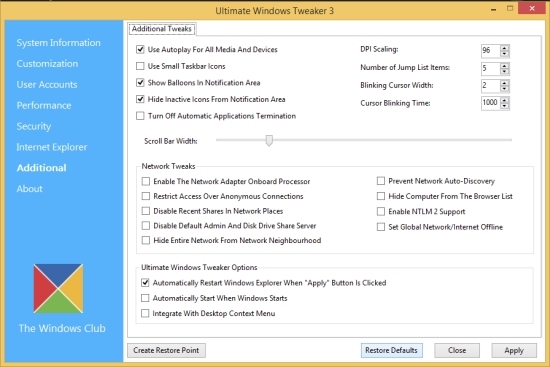 Ultimate Windows Tweaker is a free software that lets you easily customize and tweak your Windows 8 OS. It’s a simple, yet feature-packed software that helps in quickly customizing the appearance, security, and settings of your Windows 8 system through a simple Graphical User Interface. The software offers over 170 tweaks to make your system more stable, secure, and faster. Using this tiny software, you can do amazing system tweaks, like customizing the taskbar appearance, file explorer settings, user accounts settings, IE settings, security setting, and much more with few simple clicks! Ultimate Windows Tweaker is quite popular and has been around since the time of Windows Vista and Windows 7. The freeware has now come to Windows 8 and can be run on both Windows 8, as well as Windows 8.1. Let’s see how to use this software. Ultimate Windows Tweaker is available as a complete freeware and can be downloaded using the link given at the end. The download consists of a zip file which you can unzip to extract content. The unzipped folder will contain an .exe file, which is the main application file. Just double-click on this file to launch Ultimate Windows Tweaker; no installation is required. 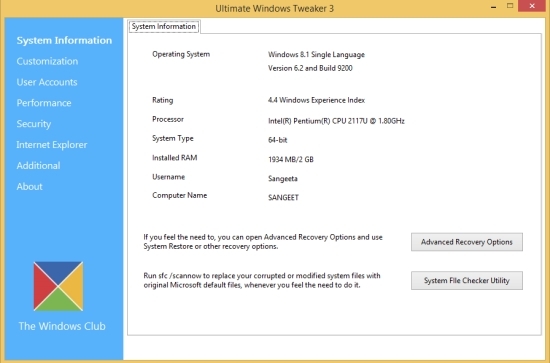 Once launched, you can use the program to tweak your Windows 8 OS easily. Note: You are strictly advised to create a system restore point before you tweak settings and make changes to your system using this freeware. As you launch the program, you will see its main interface with different tabs listed at the left side and information under the selected tab on the right. The first tab is about System Information, so you will see your system information like the OS version, Processor, System Type, RAM, Username, etc., on this tab. You can also access Advanced Recovery Options from this tab. The second tab, which is Customization, hold options to tweak Taskbar settings, File Explorer Setting, Metro UI settings, and some additional settings. You can enable/disable some of these settings by clicking the checkbox present against each entry, or move the sliders to adjust the values for rest of the settings. Click on “Apply” button to save changes. Some options also allow quick actions without using the “Apply” button. Click on “Restore Defaults” to get back to the default settings anytime. The next tab, which is User Accounts tab, lets you tweak settings for the various user accounts you have created on your Windows 8 PC. From this tab, you can enable/disable showing last logon information on the logon screen, enable/disable group policies on startup, keep/remove shutdown tasks from logon screen, change logon screen display message, specify action for system failure, and do much more. Next is the Performance tab which enables you to do system performance tweaks, like changing waiting time for different actions, enabling/disabling Tablet input service, Windows update service, prefetch service etc., and tweaks like that. The next tab, Security tab, lets you impose administrative restrictions like disabling Registry Editor, Control Panel, Task Manager, UAC, turn off user tracking, etc., on your Windows 8 PC. Next is the Internet Explorer tab, that enables you to customize settings of your IE browser though the Ultimate Windows Tweaker. The last tab, named as Additional, contains some additional tweak options like using Autoplay options for media and other devices, balloons in notification area, automatic updates termination, and some other network tweaks. This is all about the functional part of Ultimate Windows Tweaker, let’s have a quick look at its features. Freeware to tweak and customize Windows OS. Collection of a huge number of (170+) system tweak options at a single place. Option to create Restore Point, displayed as a reminder. Option to Restore Defaults anytime. Don’t forget to check Advanced SystemCare we reviewed earlier. 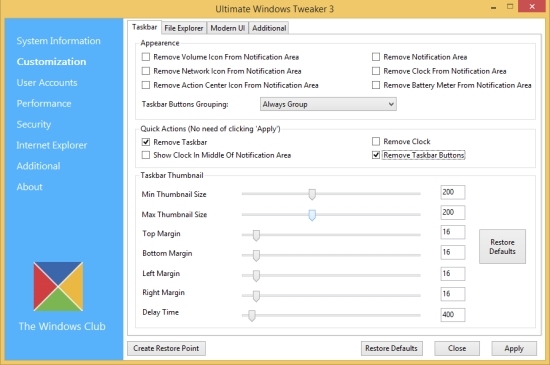 Ultimate Windows Tweaker is an excellent freeware to customize your Windows 8 settings through simple tweak options. Give it a try, but don’t forget to create a system restore point prior its usage. Do share your feedback in comments. Get Ultimate Windows Tweaker here!